BYLAWS OF FRIDAY MUSICALE, INC. The name of this corporation shall be Friday Musicale, Inc. The organization is based on a four stakeholder concept. The first is the community at large that provides audiences, members, and funding while receiving Friday Musicale’s products and services. The second is the membership that structures the organizational framework. The third is the Board of Directors that provides community influence, internal policies, and evaluations. The fourth is the Administration that staffs and implements all planned and ongoing programs. Article VIII of these bylaws charts the above relationships. The purpose of Friday Musicale is to bring exceptional music programs, education, scholarships, and opportunities to the Greater Jacksonville community. (a) Any individual interested in furthering the purpose of the organization is eligible for membership. Membership in Friday Musicale, Inc. is open to all in accordance with the organization’s diversity policy. Membership applications may be submitted at any time, and membership and membership privileges are effective upon payment of the appropriate dues. (b) Dues are payable annually upon initiation and thereafter upon each membership anniversary date. (c) The Board of Directors shall determine dues amounts and membership privileges through a majority vote of directors at a Board meeting. (a) There may be several classifications of membership as determined by vote of the Board of Directors. Each class shall have dues and related perquisites approved by the Board and published in Friday Musicale’s collateral information. (c) Honorary Membership shall be conferred only for outstanding service rendered to Friday Musicale, and carries with it all the privileges of active membership. Honorary Members shall be proposed and determined by majority vote of the Board of Directors. Honorary and Life Members shall be exempt from payment of dues. (a) The annual meeting of the members shall be held in September at a time and place set by the Board of Directors. Notices of agendas and matters to be voted on at the annual meeting shall be in writing and shall be mailed or electronically transmitted to reach each member at least 10 days prior to the date of the annual meeting. A quorum of the membership shall consist of fifteen (15) members in good standing in attendance. If a quorum is not present the meeting shall be postponed for no longer than fourteen working days. (b) Voting shall be by members in attendance or via signed electronic and/or standard mail received in time for the meeting. There shall be no proxy votes. (c) The annual report of the Board shall be submitted to the membership at the annual membership meeting. (d) Special meetings of the members may be called by the Board Chairperson upon the written request of five (5) members of the Board .of Directors, or ten (10) members of Friday Except in an emergency, written notice shall be sent to each member so that it can be received three (3) days prior to the meeting. E­mail to the last known address shall constitute proper notice. Directors shall be elected by the membership at the annual membership meeting. A nomination slate shall be presented by the Board Nominating Committee. Additional nominations shall be taken from the floor. The vote shall be by ballot. A majority vote by a quorum of the members shall constitute approval. Membership may be terminated by written resignation by the member, and/or non-payment of dues for one (1) year, following written notice of delinquency. (a) Friday Musicale in its policies, values and practices, is committed to inclusion and There shall be no barriers to membership in the organization on the basis of gender, race, creed, age, sexual orientation, national origin, or ability. (b) Friday Musicale directors, management, members, and staff shall not participate, while on Friday Musicale duties, in any political partisanship activities or campaigns. Nepotism and cronyism by the organization’s Board of Directors and staff personnel is prohibited. Hiring and remuneration shall be performed with professional or workplace merit as a main consideration. 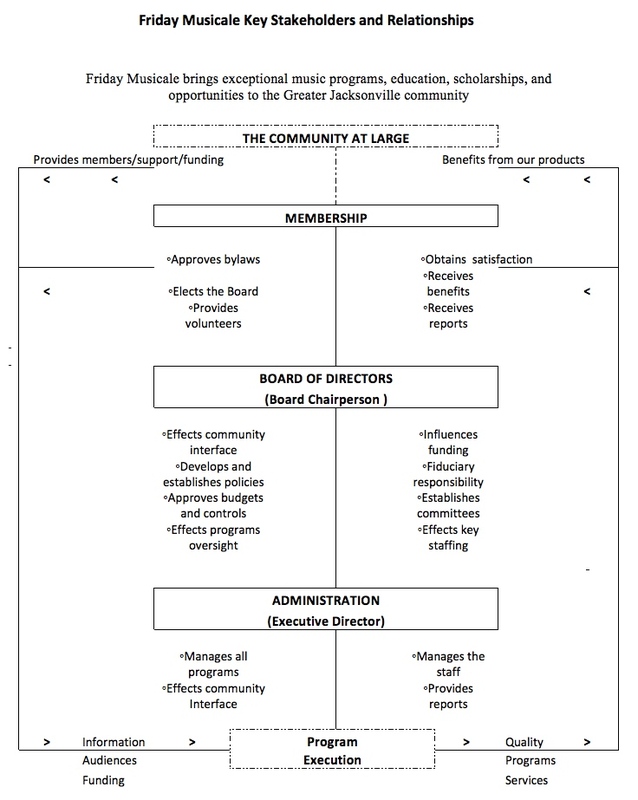 The Board of Directors, henceforth called the Board, shall advance the merits of the organization and influence the acquisition of funds in the community; develop and approve organizational policies; provide governing bylaws and evaluations; approve yearly budgets; invest organization’s financial assets; bear the fiduciary responsibility of the organization; plan and develop musical events; evaluate and develop plans to expand or maintain company facilities; develop membership programs; employ key executives; and assist the administration during program executions. The Board shall be led by a Board Chairperson, henceforth called the Chair. (b) Directors: Directors shall serve without compensation and be nominated by the Board Nominating Committee from the membership (Internal Directors), or from outside the organization (Outside Directors). Directors shall serve for a term of two years. A Director may serve the Board for two (2) consecutive terms. A Director who has served for two (2) consecutive terms must take a one-year hiatus before consideration of Board service in the future. A Board member may be elected as an officer between terms as Director. However the total time served as a member of the Board may not exceed three (3) terms. (c) Officers: The Board Chair, the Treasurer, and the Secretary shall be elected by the newly elected Directors at a fiscal year’s first Board meeting. (d) Chair’s Advisory Council: The Board Chair may invite past board members to participate in an advisory Council and at a Board meeting as a non-voting participant. Members of the Council may initiate issues through the Chair, and may be asked to participate in committees. (a) The Board shall meet not less than five (5) times during the fiscal year. Meetings shall be scheduled initially at the beginning of the fiscal year as to time and place thereafter rescheduled or cancelled by the Board Chair. The agenda and other information shall be transmitted to Board members ten (10) days in advance of the meeting date. (b) Special meetings of the Board may be called by the Board Chair or upon the written request of five (5) members of the Board. Except in an emergency, written notice shall be sent to each board member so that it can be received three (3) days prior to the meeting. E-mail to the last known address shall constitute proper notice. Fifty percent (50%) of the Board’s Directors and Officers shall constitute a quorum for transaction of business of the Board. A quorum is considered met through personal or continuous electronically transmitted coherent hearing and voice presence. Voting on seconded motions that are ongoing, delayed, or tabled may be performed within a limited forty-eight hour period through real time communications, including e-mail. Board communications shall be undertaken by verbal means, telephone, regular mail, e-mail, or text messages. Members shall state their communications preferences. Telephone or text messages may be used to alert members of sent critical e-mails requiring action. Members shall be considered informed on all action communications sent to them by the administration or other members. If a Board member anticipates being absent from a Board meeting, the individual shall inform the Board Chair or the Executive Director as to the reason. If a Board member is absent without the above mentioned communication from three consecutive Board meetings within the fiscal year the Board member will be deemed to have resigned and the position declared vacant. The Board, upon receiving nominations by the Nominating Committee or as appointed by the Board Chair, shall fill any vacancy on the Board for the unexpired portion of the term. (a) Board member conflicts of interest between the organization and their outside activities shall be avoided and not allowed. A conflict of interest is a set of circumstances that creates a risk that professional judgment or actions regarding Friday Musicale’s interests will be unduly influenced by an individual’s personal or professional activities. (b) The Board may remove a Director with or without cause by majority vote of the entire Board. A Director may resign at any time by notifying the Board Chair in writing and such resignation shall take effect at the time therein specified. A Director may resign as a member of the Board without resigning as a member of the organization. Section 1: The Board shall contain five (5) standing committees, led by Committee Chairpersons henceforth called Committee Chairs, and other such committees that may be required to further the work of the Board. The committees form a community influence and knowledge base for the organization’s policies. The Board Chair shall be an ex-officio member of each committee. (a) Annually, the Board Chair shall appoint a Governance Committee consisting of a Committee Chair and up to three (3) Directors or members. It shall be the duty of the Governance Committee to recommend policies to the Board pertaining to governance issues and processes, including orientation and training of new Board members, evaluation and improvement of the contribution of individual Board members and officers, and recommendation for revised or amended bylaws changes. (b) The Governance committee shall also serve as the Nominating Committee and develop a roster of potential members and community persons to be used in preparation of a slate of nominees for Board Directors. The committee shall also facilitate nominations from the membership by mail, from the floor at the annual meeting, and by proxy when deemed necessary. These nominations shall be presented to the Board before the annual meeting no later than the September meeting. Work with the Board Chair, Executive Director, the Committee, and community human resources as needed, in accomplishing the duties of the Committee. Coordinate with the Board Chair and recruit members for the committee. Set the agenda and convene working meetings of the Committee as necessary. (a) Annually, the Board Chair shall appoint a Finance Committee consisting of a Committee Chair, the Board Treasurer, and up to three (3) Directors or members. It shall be the duty of the Finance Committee to periodically oversee all financial reports and records; oversee the annual financial analysis by a Certified Public Accountant; review, approve, and present the formulated budget annually to the Board of Directors prior to the September meeting; set and approve the annual scholarship disbursements, and execute and evaluate all financial investments of the organization. Work with the Board Chair, Board Treasurer, Executive Director, Committee members, and community human resources as needed, in accomplishing the duties of the committee. (a) Annually, the Board Chair shall appoint a Concert Committee consisting of a Committee Chair, and up to four (4) Directors or members. It shall be the duty of the Concert Committee to plan the musical programs, work with artists and their agents, assist the administration with contracts and concert logistics, and oversee all musical presentations including but not limited to the annual concert series, summer music festival, and educational outreach programs. The Chorus and Outstanding Young Pianist Committees shall be sub-committees of the Concert Committee. (b) The Concert Committee Chair shall have the organizational title of Artistic Director.  Work with the Board Chair, Executive Director, Committee members, community human resources as needed, and outside music professionals in accomplishing the duties of the Committee. (a) Annually, the Board Chair shall appoint a Facilities Committee consisting of a Committee Chair and up to three (3) Directors or members. It shall be the duty of the Facilities Committee to plan, approve facilities budgets, assist during program execution, and oversee the maintenance, renovation, and any increase in the physical plant of Friday Musicale. Work with the Board Chair, Executive Director, Committee members, and community human resources as needed, in accomplishing the duties of the Committee. Coordinate with the Board Chair, and recruit members for the Committee. (a) Annually, the Board Chair shall appoint a Membership Committee consisting of a Committee Chair, and up to three (3) Directors or members. It shall be the duty of the Committee to plan the extent of the membership program; set membership policies; approve membership budgets; assist in program execution, and oversee membership matters such as membership fees, benefits, volunteerism, and social events.  Work with the Board Chair, Executive Director, Committee members, the membership at large, and community human resources as needed, in accomplishing the duties of the Committee. The Board Chair or Committee Chairs may create additional ad hoc or special committees as required to further the work of Friday Musicale. (a) Committees shall be formed to initiate or receive from the Board referred issues, and to take action to resolve such issues in a timely manner through work interface with other committees, the administration, or external individuals and appropriate networks. (b) All committees shall report to the Board Chair and present their findings or reports for Board actions if necessary. (c) The Board Chair and the Executive Director shall be ex-officio members of each standing committee, except the Nominating Committee, unless otherwise specifically provided by resolution of the Board or these bylaws. (d) Committees shall meet on the premises of Friday Musicale or elsewhere at times decided by the Committee Chair upon consultation with committee members. (e) No committee or committee member shall have the power to commit Friday Musicale financially or in any other manner except when specifically authorized by the Board Chair or the Executive Director, or as otherwise stated within these bylaws. (f) Notwithstanding any other provision in these bylaws, each member of any committee established under this Article IV shall serve at the pleasure of the Board and may be removed with or without cause. Section 1: Friday Musicale’s administration is a main part of its organizational structure (see Article VIII) and shall undertake all managerial and administrative matters that will achieve the organization’s policies, programs, and budgets during direct and restricted operations. The administration shall work closely with the Board to obtain operational effectiveness and efficiencies in all programs. The administration shall closely follow these bylaws and any operational manuals published in the area of finance, personnel, facilities, and in other areas that may be developed. (a) The Executive Director shall report to the Board through the Board Chair. The Executive Director administers all Friday Musicale’s functions and the staff. The Executive Director manages the organization’s programs; develops a yearly budget; undertakes timely funding drives and events; manages the membership and its volunteers or outside volunteers; promotes and manages the rental facilities and concert schedule of Friday Musicale; and actively participates with voting privileges in Board deliberations associated with program definitions, planning and budgeting, but not in the Executive Director evaluation. (b) The Executive Director takes effective actions to market and promote Friday Musicale’s mission and programs in the general community, in musical environments, and within professional management associations. The Board Chair or the Executive Director may create additional ad hoc or special committees as required to administer Friday Musicale programs. No director, officer, or staff member is authorized to make personal payments on behalf of Friday Musicale. All checks, drafts, or orders for the payment of money, notes, or other evidences of indebtedness issued in the name of Friday Musicale shall be signed by the Board Chair, or the Executive Director, or the Board Treasurer, or such agent or agents of the organization and in such manner as it shall from time to time be determined by resolution. No debts shall be authorized by any Director, officer, or agent or agents on behalf of the organization except by the authority of the Board. The Board Chair or the Executive Director shall solely enter into contracts in the name of Friday Musicale. They may authorize any Director or member, or agent or agents to enter into any contract or execute and deliver any instrument in the name of and on behalf of the Friday Musicale unless otherwise restricted by law. Such authority may be general or confined to specific instances. The fiscal year of Friday Musicale shall begin on October 1st and end on September 30th. The rules contained in the current edition of ROBERT’S RULE OF ORDER NEWLY REVISED shall govern in situations not covered by these bylaws and in any other rules of order adopted by the Board. These by-laws may be amended in part or as a whole by a two thirds vote at a Board meeting provided that notice containing the general effect and intent of the proposed amendments has been given and reached all members of the Board at least 10 days prior to such meeting. The at large membership shall be provided with any amended bylaws within thirty (30) days on the Friday Musicale web-site or through the U.S. mail.